We have all been very busy here in St. Aidan’s preparing for Christmas. 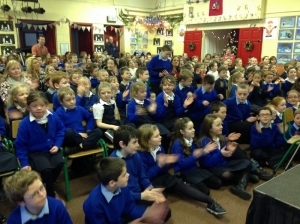 On 8th December St Aidan’s N.S. 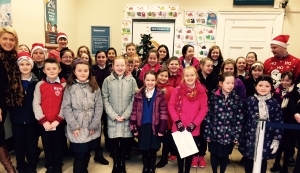 Choir ( pupils from 3rd-6th Classes) visited the local bank and Credit Union where they sang carols and Christmas songs under the direction of Ms. Lee . 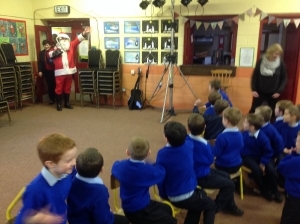 All classes were very busy preparing for our Christmas concerts on Wed 16th and Thurs 17th Dec. We all enjoyed singing along to Jingle Bells at the Junior Infants’ dress rehearsal! Click here for lots of information about our concert. 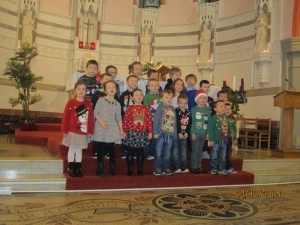 Junior Infants sang some of their Christmas songs at the Parish Carol Service in the Church of the Holy Family on Sunday 20th Dec.
Second Class also performed a nativity play at the Parish Carol Service. 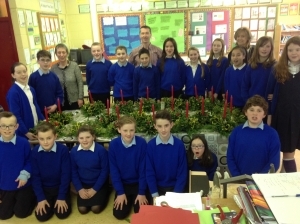 Sixth class made these lovely Christmas centre pieces with the help of retired teacher Mrs Mooney and our Learning Support teacher Mrs. Macken. 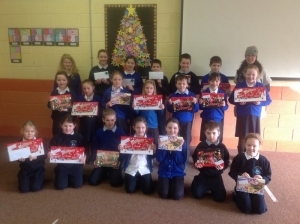 Santa visited us on Fridayday 18th Dec.
On Monday 21st Dec. Susan, from Kiltimagh Credit Union, presented prizes to the winners of the recent Credit Union Poster Competition. Congratulations to all the winners! 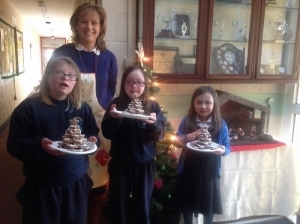 Mrs Macken made these tasty gingerbread Christmas trees with her pupils! 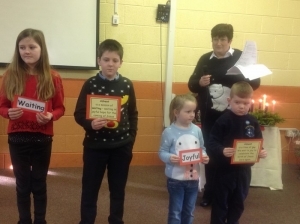 On Tuesday 22nd Dec the whole school community assembled in the school hall for a short prayer service during which we listened to the Christmas story and reflected on the true meaning of Christmas. The school Choir under the direction of Ms. Lee sang some carols. 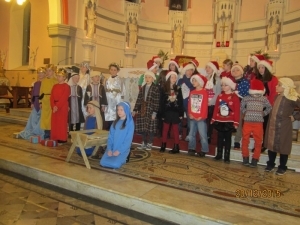 The prayer service concluded with two children from 2nd Class placing Baby Jesus in the manger. December has indeed been a very busy month!